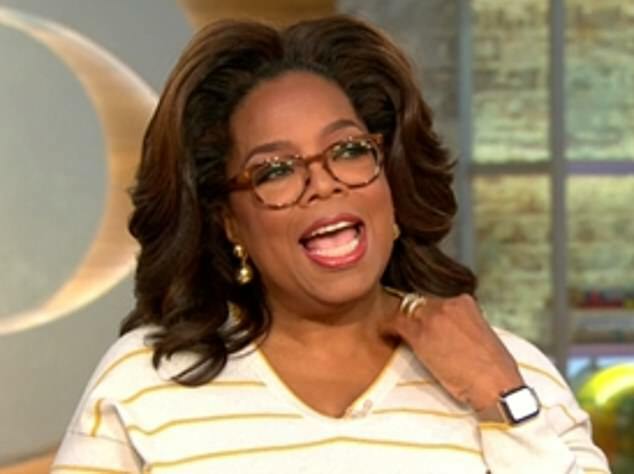 Oprah Winfrey praised her new friend Meghan Markle on Wednesday during an appearance on CBS This Morning. Oprah then revealed that Markle does not read any of her press, before going on to speak about working with Prince Harry on a new docuseries for Apple about mental health. Oprah said that she has been spending a great deal of time in London recently as she works with Prince Harry on their new series. 'As you know, he's spoken about his own issues and what he went through after his mother died and how being able to talk about it has benefited him,” Oprah said. 'So it's a passion of his and, at the end of the conversation, I said, "Oh, I'm going to be doing this thing with Apple. It's a big concern of mine too and I want to try to erase the stigma." That is when Oprah said she pitched the idea of Harry coming on to help build the series, and the TV titan said he has been incredibly involved in the project ever since. The Duke of Sussex was the one to break the news of the collaboration on Wednesday. 'I am incredibly proud to be working alongside Oprah on this vital series which we have been developing together for several months,' stated Prince Harry. This is not Prince Harry's first foray into raising awareness for mental health, having previously launched Heads Together in 2017, a mental health initiative spearheaded by The Royal Foundation, which worked on alongside his brother Prince William and sister-in-law Kate Middleton. That same year her spoke about his own struggles with mental health on the Mad World podcast. 'I sort of buried my head in the sand for many, many years. I can safely say that losing my mom at the age of 12 and therefore shutting down all of my emotions for the last 20 years has had a quite serious effect on not only my personal life, but also my work as well,' revealed Harry.